Alberta is a Canadian province that was established in 1905. Between 1901 and 1906, the population more than doubled. Most of the new residents came from the British Isles, the United States and the continent of Europe (chiefly Austria, Hungary and Russia). At the time Edmonton had a population of 11,167, Calgary 11,967 and Medicine Hat 3,020. The largest three cities in the province are now Calgary (1,230,915), Edmonton (877,926) and Red Deer (100,807). This vintage Alberta Canada Map shows the province around 1911 or before. The map itself wasn’t dated but it was included in an 1911 encyclopedia. It identified the railways, canals and path of the Grand Trunk Pacific Railway. 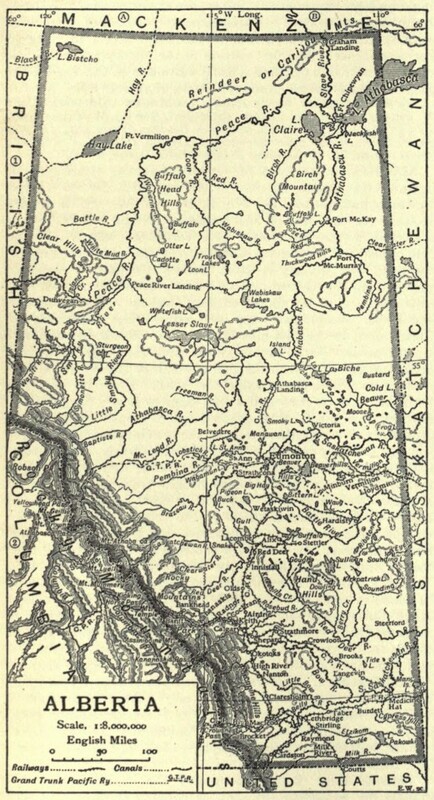 Because the map includes the Grand Trunk Pacific Railway, it more than likely was drawn after 1905, when construction began. However, the transcontinental railway was not completed until 1913. I was fortunate to find a nice large scan of this vintage map. The image you see here is a smaller version. Just click on it to access the full-sized one.